For those of you looking to take off the pounds for the swimsuit season, Garmin has a great iPhone-compatible solution to track your workouts and keep you accountable. First, the Garmin Fit™ App for iPhone allows you to track your workouts in real time like many other apps. The real magic comes in with Garmin’s ANT+ Adapter for iPhone ($49.95) which allows you to interact with other fitness devices via a standard similar to Bluetooth. Garmin’s own heart rate monitor ($60.00) and Foot Pod ($69.99) interact with the ANT+ adapter and feed real time data into the Garmin Fit™ iPhone app, showing not just the distance you did, but how hard you worked out and how many calories you burned, so you can adjust your workouts accordingly. The app allows you to track your improvements and lets you strive for a bit harder, faster, or stronger workout. A third monitoring device made by Garmin and compatible with the iPhone hardware and software solution, the Speed/Cadence Bike Sensor, I didn’t test since I tried the Garmin solutions on internal gym fitness equipment. Although it’s easiest to buy all your products from one place, the fact that the ANT+ adapter uses an established standard means you can interchange the Garmin Fit app and monitoring product as well as mix and match devices and apps that comply with ANT+. Standards are always easier to work with than proprietary solutions. Many gym devices already support ANT+ so you may not even need additional equipment besides the adapter. While I am by no means a runner or fitness guru, the combination of the hardware and software gave me the data I needed in a way to understand it in order to improve my workouts and increase my cardiovascular fitness while losing weight. Before I got the Garmin solution, I used a separate heart rate monitor with a watch. This was very difficult to use because any tracking required me to type the information into another application and that data was only a summary. I couldn’t see exactly how long I was at my target rate or adjust my workouts to exceed my goals. The quality app combined with the Garmin fitness solution is an excellent combination for anyone looking to monitor their workouts a bit closer to maximize effectiveness. Cons: You still have to work out! Being a reasonably active person who loves listening to music (and occasionally picking up a call) while working out I was very excited to hear (pardon the pun) about the Jabra Sport Bluetooth headset. 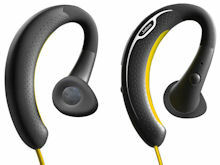 These are great workout companions and all around excellent handsfree for your iPhone. The Sport has 3 basic functions: Bluetooth audio, FM radio, and handsfree phone. All these functions are integrated into an extremely lightweight set of earbud style devices that are rain, dust and shock resistant. The Bluetooth audio had great sound, but it was often a bit too low to listen to at the gym. I had trouble getting them to fit correctly into my ear. Fortunately a set of Yurbuds came to the rescue and I was extremely happy! The FM radio was good for gyms that broadcast the TV audio system on a close range frequency. Now I could watch TV and do the treadmill at the same time. As a handsfree accessory for my iPhone, it was very easy to make and receive calls. Voice Control worked like normal which is to say not so great (no iPhone 4s with Siri test with!) Even while on the run, callers could hear me well and I could hear them. I was able to hangup on a caller and end the conversation from the controls on the earbud. In general as a Bluetooth accessory, this device had some great added features that made it a delight to use. The device uses lights as well as verbal signals to tell you when you are paired, powered on, powered off, and connected. This is a great feature since the device is in your ear, you can’t easily see if it’s properly working. Besides difficulty with the sound levels, as a glasses wearer the device’s wrap around style did cause some interference. I’d have to put the Jabra on first and then my glasses; not a major inconvenience, but a minor annoyance. The killer feature was the way it tracked battery. When the battery gets low it announces battery low over your audio (but not during a call). As it gets lower the warnings get faster. Additionally the device taps into a underutilized iOS feature that tracks the battery level of a Bluetooth handsfree device. The icon shows up next to the Bluetooth icon and is in the shape of Apple’s original Bluetooth handsfree for the iPhone. Now I could see exactly how much I had left and when I need to recharge. Nothing is more frustrating than your tunes cutting out midworkout. With 4.5 hours of talk time and 3 hours of music you’ll have to charge it often, but it uses a standard micro-usb port as well as includes an AC adapter for charging independent of a computer. Overall great sound with a set of killer features that make this a welcome addition to your workout. When I think of a tank, I think of something that is extremely impractical for everyday use and in that sense the Casemate Tank indeed fits the bill: big, bulky and impractical. While it appears to protect your iPhone well, it’s simply isn’t competitive with other similar products. This case is unique - typically extreme cases have a hard plastic interior and a softer silicone exterior to absorb impact and protect the headphone jack, dock, and volume switches. The Tank has a hard shell with integrated internal softer silicone protectors for the headphone jack and dock which are where moisture sensors are located. Because it’s integrated, you can’t chance the color when you want to try something different. The volume switches are protected but the speakers, microphone, rotation lock and camera remain naked and exposed to the world. This was an poor compromise in my opinion. Why only protect some parts if you are already adding bulk in the exterior? Another feature of extreme cases is an integrated screen protector. No worrying about applying plastic to the screen with bubbles and lint trapped underneath. The drawback of the plastic overlays is they do impact the vibrancy of the screen as well as the general sensitivity. The case uses an accordion plastic overlay that can easily be pulled back to provide extra protection when not in use and full access when retracted. On first glance this seemed like a great feature. This accordion plastic was thick and easily withstood direct impacts. A plastic overlay simply can’t protect like that. Unfortunately this for me was its greatest downfall. That thick plastic wasn’t fully transparent so anytime I had to read anything, I’d have to go through the process of retracting the plastic - even to answer the phone and see who was calling. I found myself too often keeping the plastic retracted and thus leaving my screen fully exposed. One great feature of the Tank is an extremely well engineered belt clip. The iPhone fit tightly into a full cradle style clip. There was no risk of this slipping out like I find too often with other cases that are only gripped on the sides or the ends. The actual clip portion of the belt clip was several inches long and attached securely to my side. As a big guy, this was the first and only belt clip I was confident wouldn’t slip off when I got down or sat up. Since the screen faces outward in most belt clips, that screen protector is a great feature while it hangs on your side. My problem with the Tank is that I’m the type of person constantly using the phone to play games, answer emails, check social media and even making phone calls. I can’t imagine going five or ten minutes and not using my phone for something and thus got extremely frustrated having to constantly move the screen protector out of the way. If you are that type of user, you’ll find the Tank about as practical as going grocery shopping in an M1. However, if you keep your iPhone in your purse or book bag, that thick plastic will keep it well protected as it bounces around and bangs against keys, books and miscellaneous change. The belt clip was outstanding if you keep your phone more to your side than in your hand. You--with the self discipline not to be checking your phone all the time--I envy you. If you check your phone constantly, the Tank is an exercise in frustration. However if screen protection is your ultimate goal and you don’t check your phone that often, the Tank may be your secret weapon to avoiding screen replacement. The best offense is a good defense as they say. The one “senior” aspect of this book is the typeface. It’s BIG. Obviously it’s designed for those that may have trouble seeing. The book is designed for person that may not feel comfortable with technology which includes not just seniors but really anyone. Having worked with seniors, I think this book presented too much information too quickly and the average novice might get overwhelmed with so much to do and configure on the iPad, and the books goes way beyond the basics. Overall, for a senior that already feels comfortable with technology and is eager to learn, this book is a good fit. For novices or those afraid of technology, this may be too much.